Want to be notified of new releases in uelab/KidsRecorder? A recorder for research with kids. 1.5 - If you want to use Amazon AWS for uploading recording files, please add the AmazonAuthenticationActivity in the AndroidManifest.xml. Add FileExplorerActivity and FileExplorerActivity as well if you want the activities. Please specify the later two activities as the child activity of the main recording activity. 2 - Because the RecordingManager is a Service, we need to add corresponding Service in the AndroidManifest.xml. 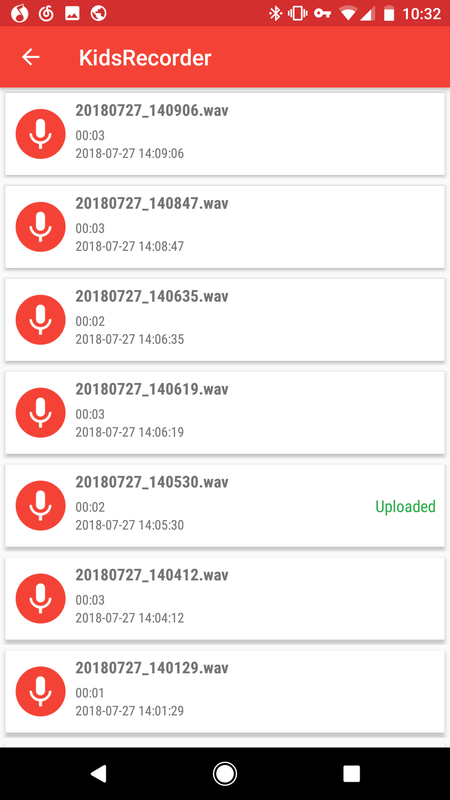 3 - If you want to enable share function of the recording files, please add following settings in the AndroidManifest.xml to enable file sharing uri. 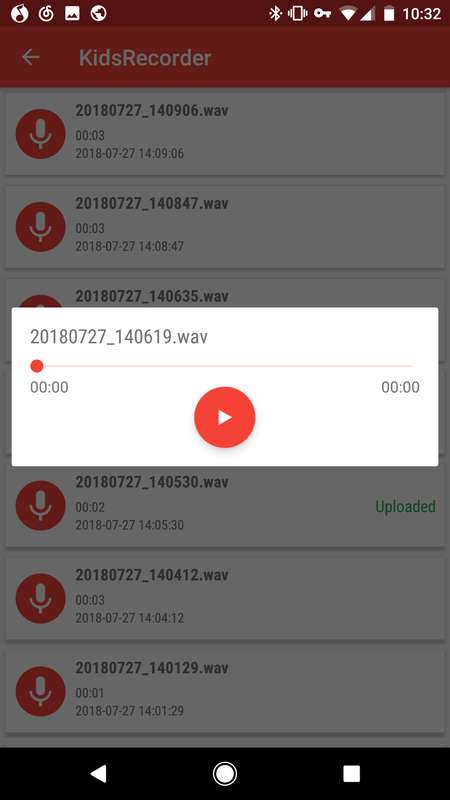 Communicates with DataManager when recording finishes. DataManager will manage remaining data operations. 1 - Initialize the RecordingManager and DataManager in your recording activity. Notice that DataManager is a singleton class (which means there would only be one instance in the whole application), thus we need to call DataManager.getInstance() to get the instance. Then after checking all permissions, start the RecordingManager Service. Because we will interact with the service later, thus we need to bind it to get its instance. The following code describes how to start the service and bind it. 2 - Let's start recording! 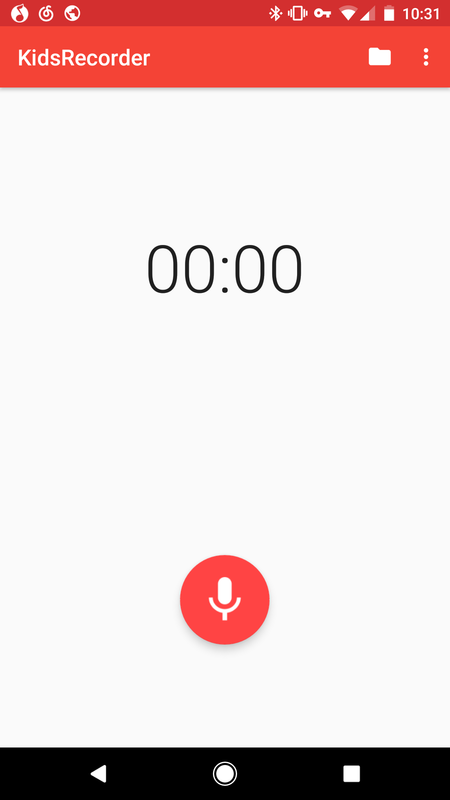 Preceding mode means when recording, a preceding time will also be recorded. 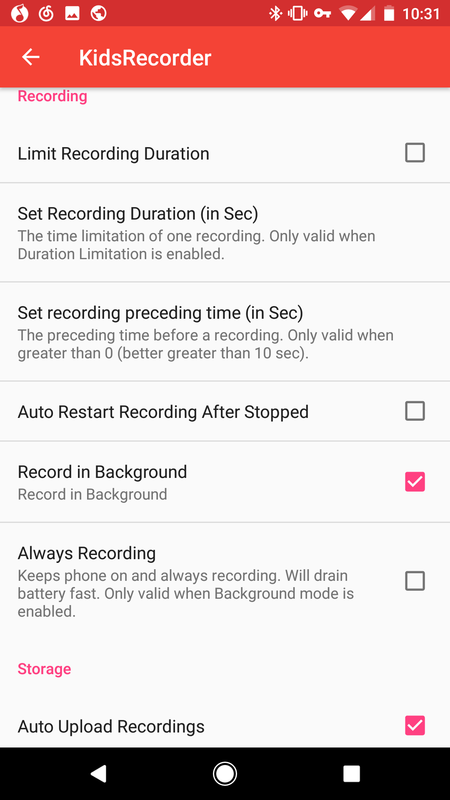 For example, if we set preceding time to 10 seconds, when the user click "record" button (a formal recording), 10 seconds before the buttonclicking would also be stored. The mechanism of preceding mode is that RecordingManager would keep recording small clips that equal to length precedingTime. When the formal recording is triggered, it would stop the small recording, and keep the former two clips, then start the formal recording. When the formal recording ends, it would start small clips recording again. If there is no formal recording, it will discard the small clips constantly. To use the FileExplorerActivity in the library, you can just include them in your project. For more details, please read the comments in the corresponding files.